CROSS COUNTRY: The Gray Bees finish off their cross country season with a strong effort in the Footlocker Regionals race at Van Cortlandt Park in Manhattan. Senior Edwin Rutto makes his return to competitive racing after missing out on the entire cross country season because of a stress fracture. Around the Northeast region two days after Thanksgiving, the running community was excited to see who would book a ticket to Foot Locker Nationals. 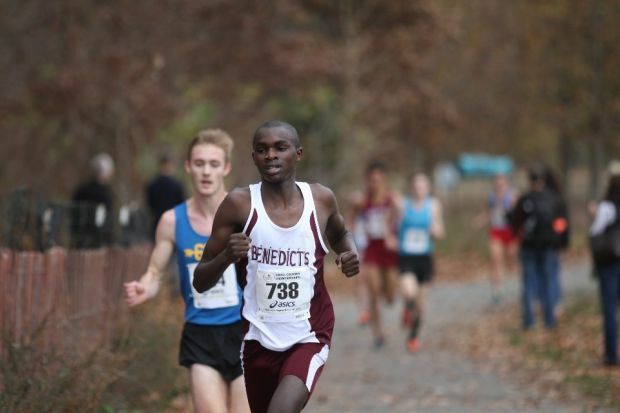 For St. Benedict’s freshman Ronald Kigen and senior Edwin Rutto toed the line at Van Cortlandt Park, eager to seize this opportunity. Even though Ronald is a first year runner here and Edwin was returning after an injury, expectations were still high. The best runners in the Northeast region gathered at Van Cortlandt Park on November 28, because the top ten finishers have the opportunity to run in San Diego, CA at Foot Locker Nationals. When the gun went off, Edwin and Ronald immediately stayed with the top ten guys. Assistant Cross Country coach, Geoffrey Ngetich reported that the first mile was around 4:40 pace, which is significantly fast. But as the race progressed Ronald and Edwin fell off pace and began falling back. With 800 meters left in the race they attempted to close the gap, but in the end they did not have enough gas left in the tank. Ronald finished 19th and Edwin finished 21st. Ronald Kigen came to Saint Benedict’s in July from the Rift Valley in Kenya. Now, he holds his ground as one of the team’s top runners. He also praised Ronald’s effort as a freshman new to the high school competitive running scene.